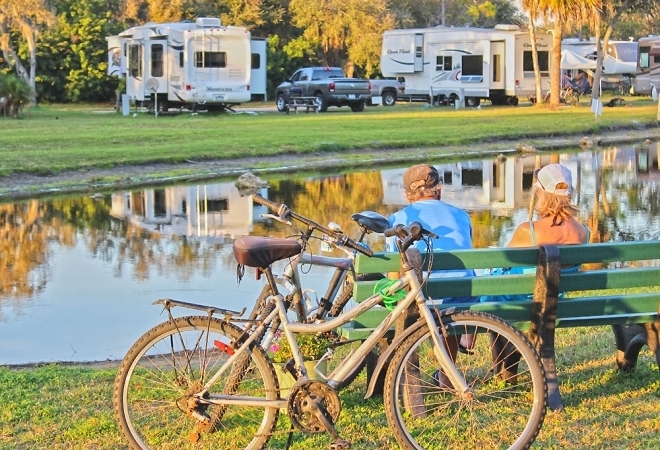 Ramblers Rest RV Resort offers the best of both worlds: minutes from the hustle and bustle of Sarasota while positioned within a tranquil, wooded resort setting. Whether you're always on the go or prefer to take it easy, Ramblers Rest RV Resort is sure to have something for you. This Florida RV park is just minutes from the Gulf of Mexico. In nearby Venice and Sarasota, you'll find a wide variety of fine dining, shopping, golfing, boating, and live entertainment within easy reach. Back at the resort, Ramblers Rest RV Resort offers a full calendar of activities and numerous amenities to entertain you throughout your stay, including a heated swimming pool, shuffleboard courts, horseshoes, a woodworking shop, arts and crafts and fine fishing. Ramblers Rest RV Resort is an age-qualified Florida RV park.